Litho device is a Holmium (2.1 μm) surgical laser offering a wide selection of settings for the treatment of stones and soft tissue surgery, together with high versatility, cost-effectiveness and ease of use. Its radiation is strongly absorbed by water, resulting in effective hemostasis and limited depth of penetration (0.3-0.4mm). Apart from urology treatments, this device can be used in the resection and ablation of different soft tissues. The compact tower design simplifies its transportation and storage, easing its use in different hospital wards. 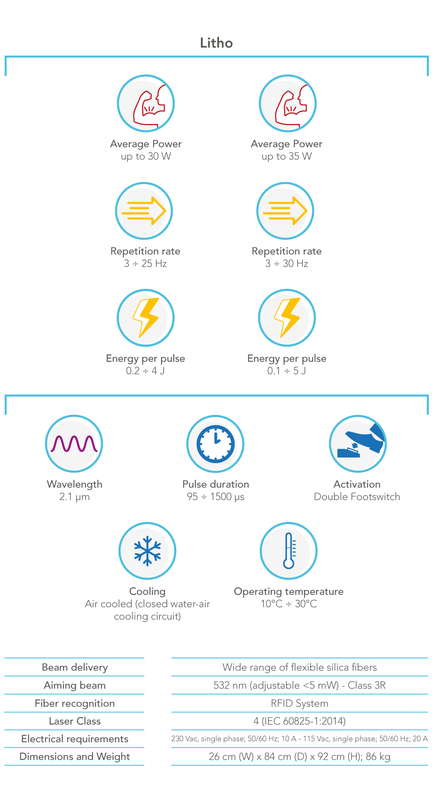 Thanks to its settings range, Litho device stands out in the segment of low power – holmium lasers. 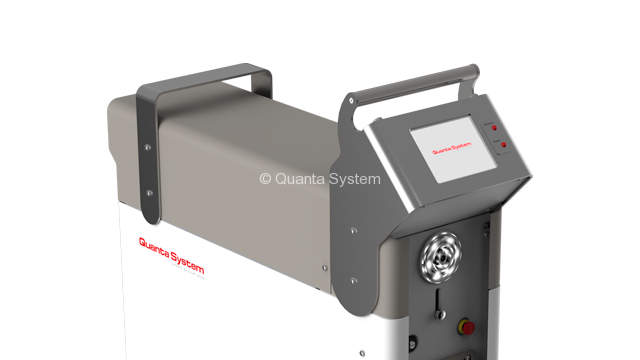 This laser provides the user with high power output (up to 35W), energy (up to 5J) and frequency (up to 30Hz), together with an extremely long pulse width (up to 1500µs). These technical features offer multiple combinations of emission and superior versatility in stone treatment and soft tissue surgery. Stone retropulsion and migration often prolong lithotripsy treatment, in particular with high pulse energy. Litho device is equipped with the Dusting Effect mode, taking advantage of the extremely long pulse width to perform a smoother ablation of stone, limiting retropulsion without affecting fragmentation efficiency. 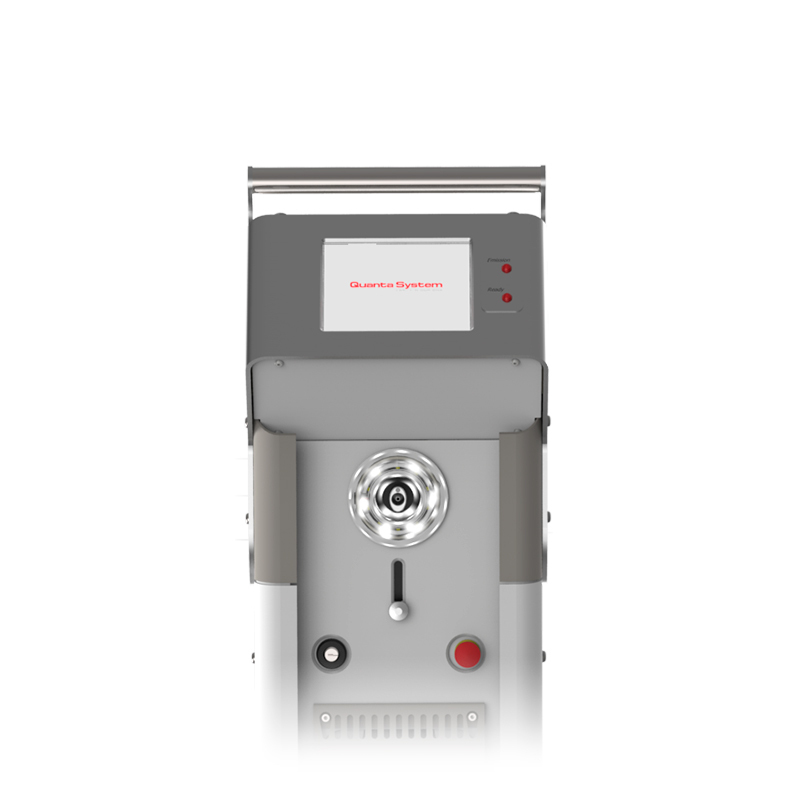 Litho device is a well-established laser technology on the global market. 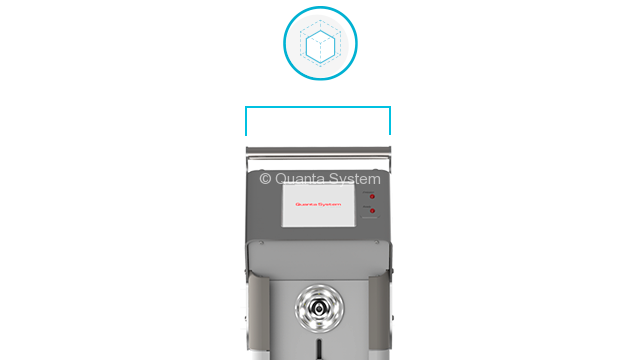 As demonstrated by its long presence on the market, (introduced in 2008) and with over 1000 installations worldwide in more than 25 different countries, this device represents a reliable, durable and cost-effective laser solution. 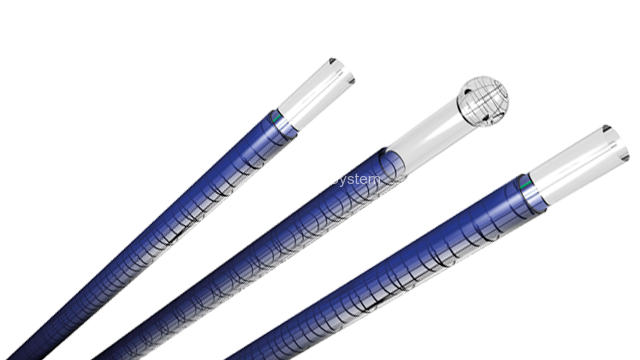 A great versatility in applications requires a wide range of delivery probes. For this reason, Litho laser is compatible with different fiber diameters (200-1000µm) and types. Apart from standard fibers, our portfolio includes ball tip fibers (for easier insertion into already bent scope), performance probes (to deliver even higher output power). 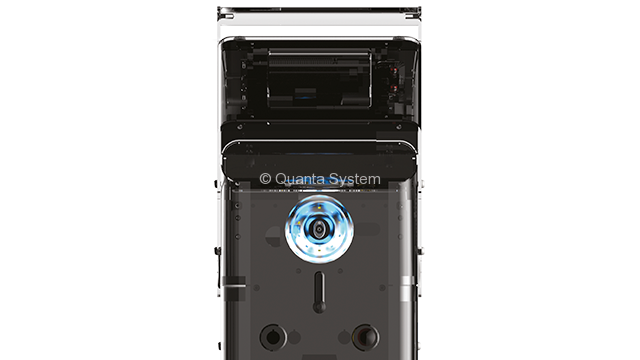 The light weight and compact tower design of the device allow easy transportation and storage in the hospital, with limited space needed in the OR during the surgical procedure. These features make Litho laser suitable for use in different hospitals and for recurrent relocations, without affecting the performances and condition of the device. Its limited depth of penetration (0.3-0.4mm), together with the incision and hemostasis properties of this radiation, enables a large variety of surgical treatments. 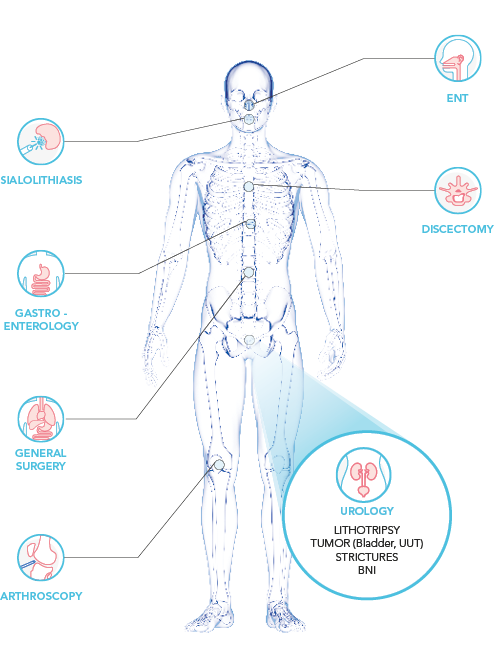 Apart from stone fragmentation (urolithiasis, salivary stones, gallstones) and urology treatments (e.g. strictures, carcinoma resection), Litho device can perform effective soft tissue surgery in other medical specialties, including General Surgery, Arthroscopy and ENT.